OUTLANDER…a serendipitous collection of people – My Outlander Blog! I know I’m not the only one out there that feels somewhat protective and possessive of the phenomenon that is Outlander. This love of the book and show,”It’s a bit personal” to quote one of our favorite characters. I’m not exactly sure how it got this personal, but there you go. I love Outlander! 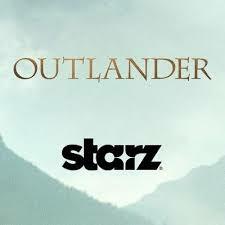 As many of you know, (of course you know, you are Outlander fans) last night was the premier of season 1b of Outlander in NYC. They called it a Tartan Affair. For weeks, fans from all over have talked of nothing but their planned trips to celebrate the end of Droughtlander, especially those who won tickets. (someone had a guaranteed spot waiting in a mailbox they couldn’t open and didn’t find out until it was too late, yep me and yes, I went into a huge spiral of self-pity) Like many of those folks who won tickets, it would have taken me a lot of juggling and maybe even mountain moving to make the dream of attending that event happen. So, when I got on-line last night to live vicariously through those lucky enough to attend, I was alarmed to see that there were fans with reserved seating tickets left standing outside the theater in the cold and left to wonder what the hell had happened. The screening was about to start and they were still outside. My first reaction was shock and then pity. I would have been crying had I been there. It would have felt like the worst April fools joke ever perpetrated. I am sure there are still people upset, but from what I saw this morning in pictures and videos a lot of folks were happy, over the moon happy. 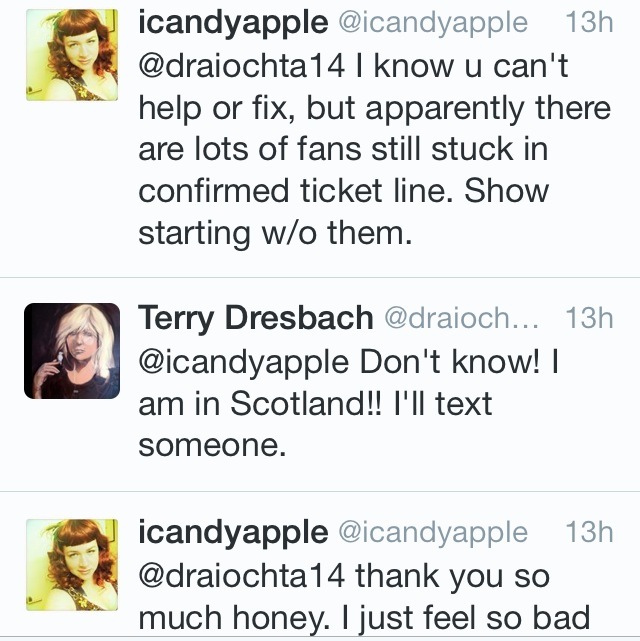 BTW, one of the Twitter Angels from last night was Ron Moore’s wife Terry Dresbach, Outlander costume designer extraordinaire. A video of Ron introducing the cast last night surfaced this morning and to me epitomized the reason why I feel the way I do about the show. The fans. The actors. The writers. The crews. The execs. The producer. The author of the book. A serendipitous collection of people. What could have come off as a lame bunch of excuses for what had happened instead became another reason to be proud. People were cheering and Ron’s character was showing for all the fandom to see. This has been a singular experience for me. My favorite book series is being made into a TV series and I have gotten to be there from the beginning. From the beginning, we have had unprecedented access to the people creating our “dream come true” of seeing our favorite story and characters come to life. They interact with us lowly fans. LOL! Just kidding! I know they don’t think we are “lowly” and that is my point. I can’t help but feel that if we didn’t have this particular collection of people we wouldn’t have had the same experience. Because of this unprecedented interaction with the author, the folks creating the show and the fans, my life has been enriched. I have engaged in wonderful discussions about the book and show that have challenged my thinking. Outlander fans are smart. If you want to get into a philosophical or intellectual discussion with them you better be prepared! I might not always agree with everyone, but I always walk away from these discussions with new perspective. I have, thanks to the Outlander phenomenon, discovered I love to write. I’m a writer. Who knew? Certainly not me. For that discovery, I will be eternally grateful. I know there are a few folks flirting with the crazy side of being a fan and other’s who find it fun to be snarky about folks obsessed with the series (IMO snarky seems to be just another word for mean girl/boy), but overall, I find myself PROUD to be a part of this whole thing. 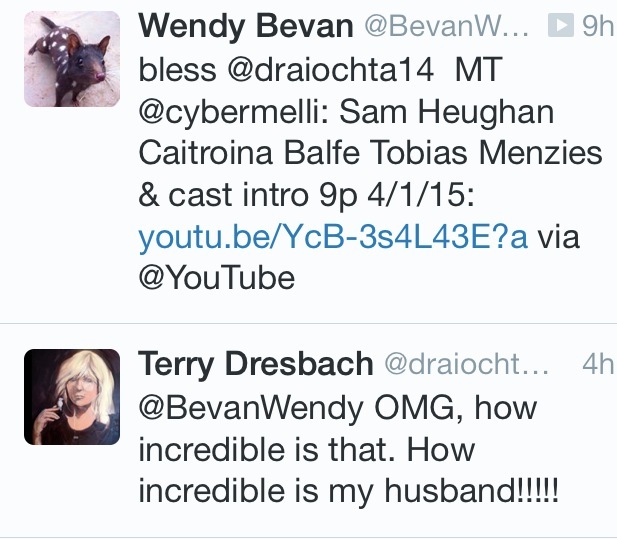 A serendipitous collection of people who love Outlander. Completely agree! I was at the LA screening last night and Matt Roberts was there. He was friendly, engaging and stayed around to talk with fans. The entire voyage has been amazing!!! I completely agree Beth. I too have made amazing friends along this Voyage. I met TheMattRoberts last night at the LA screening ( you would have thought that I was meeting Cary Grant). He was gracious, friendly and stayed way after the screening to talk with fans. Everything about this adventure has been great. I know there are lots of us who feel the same way! Thank you. Reading this is helping me to feel excited again for the return of Outlander. Thank you for sharing this wonderful story with us. We are fellow Voyager(s) (see what I did there?) on this Outlander journey and I am so happy to be a part of this tapestry of good and decent people. What a great way to launch the second half of the season! YES! Exactly how I feel. I watched all this happening through Twitter last night too. I was so happy when I found out those outside were going to get the whole experience too. It was like it was my family out there in the cold waiting. Truly impressed and I truly love these books and now this series and all involved. Being in Canada there isn’t much chance I will ever attend one of these amazing events but at least I know fellow fans will! You are right “We are so lucky.”!!!!! Thanks for posting this. I watched on Twitter last night and felt so bad for the fans that didn’t get in. That Ron Moore is a classy guy. I also feel the same about the Outlander Community. What a great phrase….”a serendipitous collection of people”. Thank you and thanks for taking the time to comment it means a lot. So glad everyone had a gran time in New York. Let me know about when and where in Nashville you guys are planning to meet. I would like to join in!! Besides loving Diana Gabaldon’s books, for 20+ years, this just makes me love everything more about Outlander! Ron Moore, his wife Terry, the cast, everyone! They are all a Class Act!! Serendipitous indeed! 2 more days to Outlander episode 9! Excellent post! 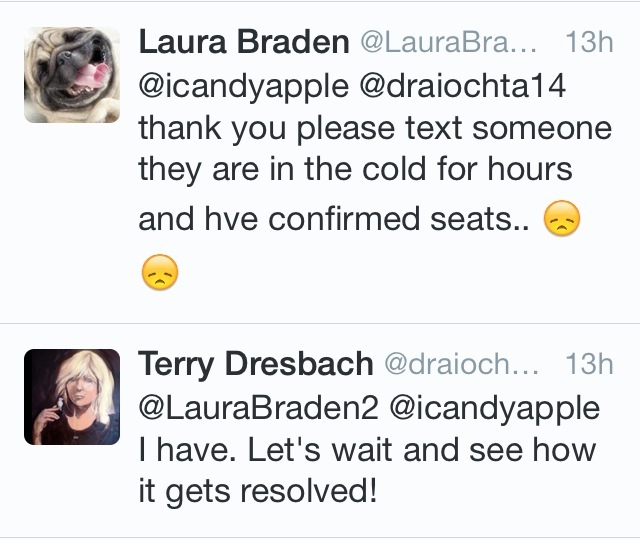 I was following the posts on Twitter last night and I knew that with Terry’s help it would be resolved. So when I saw the YouTube video earlier this evening I couldn’t help but think how wonderful these people are and how lucky we are to have them bring these stories to life! I also think they truly appreciate us! We got lucky for sure! I wish we had gotten Terri involved earlier. AND I am so happy for the second show. I am not saying this to be bitter but I was so unhappy with the way the entire first show was handled. The event filled the balcony first. As a guaranteed seat holder I was in the last row. We watched the balcony fill up and the floor seats remain empty, the person behind me in line did get one of the few floor seats. The fan group admins that got 8 tix each had floor seats. I and my seat partner actually went out and asked if we could exchange our tickets for floor seats and they admitted tickets were handed out somewhat randomly but claimed they had no tickets left….then said that the remaining seats were going to Caitriona’s and Sam’s friends! And asked us wouldn’t we want them to be in those seats? What the heck? We are not ones to cause a scene and so just backed off. The worst part was we waited 1.5 hours in the will call line to get into the balcony and then were let in by groups of 20 and rushed through the costume exhibit so they could let more people in! And apparently some of the people in the first come first serve line did pre-empt those with first showing seats! Then people after us did sit in the floor section. Just so terribly managed. It was so sad. I have been going to Diana Gabladon fan events for over 15 years…she is the most gracious author I have ever met. She stays until the bitter end. I am spoiled…I know this. However, this premier was handled in the most unprofessional manner I have ever seen. The show is a hit because of the fan base…and they treated that fan base like dirt. It is my hope that there is some serious discussion going on at Starz. I understand that the cast was upset by what they saw as well. They obviously did not understand the fan base. I’m told they really didn’t think people would show up and over sold and underprepared . I’m sad for everybody. The whole idea of a Confirmed Will Call List just makes me angry. Either you’re confirmed with a ticket (the Guaranteed List) or you’re not confirmed. There was a wait list in addition to the Guaranteed & Confirmed Will Call List. Even the words “Confirmed Will Call List” are deceptive. Many of the fans are women who were in their 20’s and 30’s when they read Outlander in 1991. These fans would not think for a single moment that their confirmation email was of no value. The event company caused the fiasco by using the words “first come first served” for the Confirmed Will Call List. The 500 Guaranteed fan seats were probably the 300 seats in the Mezzanine and 200 seats on the Main Floor. My opinion is that there was never an intention of seating the Confirmed Will Call List for the 7PM viewing. The Ziegfeld capacity is a little over 1100 and 50% of those seats were reserved for media, industry, family and friends. 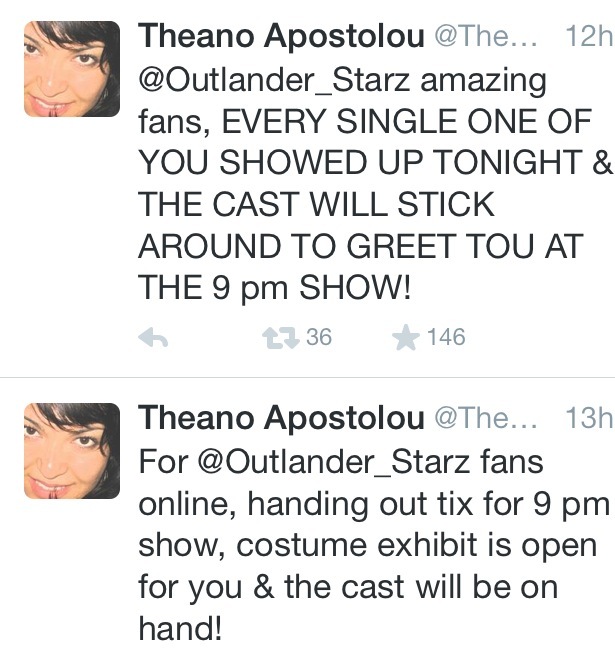 The event company did not consider the loyalty and age/gender demographic of Outlander fans. Their event statistics were that most people don’t actually attend an event, even if registered or guaranteed, so they over-subscribed the Will Call List. There was no consideration for the fans who demonstarted that they wanted to attend what they thought would be a fan oriented event. Why manage an event like this and basically turn the fan base into event line items for registration, ticketing and social media buzz? What the event company really wanted was the industry prestige of handling a premiere event for a show like Outlander. There was probably a pre-event meeting at which the event company reported how many people they had over-subscribed onto the ridiculous Confirmed Will Call List. Kudos to whoever at STARZ or Sony Television for realizing that they had a potential PR disaster brewing because they recognized the potential damage from an over subscribed Will Call List. I have the feeling that there was a scramble to pull that 2nd viewing together. The event company should have emailed the first 800 people on their Confirmed Will Call List and told them that they had a Guaranteed seat. In addition, they could have eliminated the confusion about which line to stand in by telling those 800 people to arrive at 8PM. The Will Call List was never a legitimate chance for a seat. The event company proved it by making the fans stand in line for the 2nd show. If they told STARZ or Sony that the house was less than 50% full at the 2nd viewing, it was because they were totally incompetent about ticket management and dealing with the general public. They hurt the fan base and made things so awful that many people had to walk away. Telling the fans to line up on West 55th at 5PM was not going to prevent anyone from getting there with their “confirmed” will-call email. Worse yet, there were flyers instructing people to line up on West 54th for a chance to be admitted to the 7PM viewing. I estimated at least 1200 – 1500 people in 3 lines which stretched back from 6th to 7th Avenue. Most missed the opportunity to actually SEE the cast arrive and every single person stood there for many hours on a day which was unseasonably cold. It’s my hope that this event company is never allowed to over subscribe a Will Call List again. The fine print of the registration does not indemnify the company from problems that were caused for the fans. I’m specifically referring to social media posts from fans who ended up with medical problems because the fan stood in line for too many hours. Can you imagine what would have happened if someone in the line had to be taken to the ER? Ron Moore was the “White Knight” who saved the day. He walked the line behind the Ziegfeld Theater and thanked the fans. At the 2nd viewing, his apology and acknowledgement took some of the hurt away. He restored a sense of community for the fans who “stuck it out” until the end. We were able to have the special experience of sharing the episode together and reacting to what we saw and heard. Thank you for this. I had heard very similar information from someone else with experience in this area who attended. Her conclusions were much like yours. 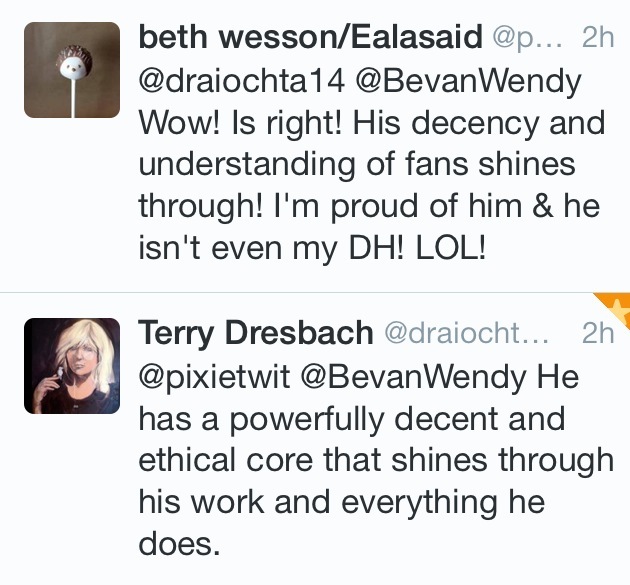 I’ve been getting a lot of feedback from the 20+ year fans who are feeling very much Ill represented and disrespected. I want the show to continue and maintain it’s loyal fan base. I’m trying to figure out the best way to approach Starz and let them know they have a problem. Thanks again. On the way into the Costume Exhibit, I remember seeing a Will Call booth and had the thought that it probably made things worse. If it was used for the Guaranteed ticket pickups, can you imagine how confusing it was for those with a Confirmed Will Call email? The event production company is 100% responsible for what happened. They missed so many little details that the problems just intensified. In a line with 1500 people, lack of coordination and planning becomes evident via the rumors which circulate. People are desperate for anything which explains their current situation. I had the feeling that STARZ took matters into their own hands for the 2nd viewing. Staffers were walking the line to tell us that “talent” was staying and that we shouldn’t worry. When the line didn’t move for 15 minutes inside the tent entrance, the staffers came back to tell us that we would be admitted in a few minutes. It happened and you could see the smiles on everyone, slowly at first but the smiles were there. Beautifully said, Beth. I completely agree about the fandom. I never thought I would be a part of something like this – but what a glorious thing it is, indeed. I am so grateful to have found people like you who make this all worthwhile! I so appreciate your comments. I’m glad you signed this sincerely because that is what I have found you to be… Sincere!